It is with immense pleasure and pride that we confirm the ISO 9001:2015 certified stature of our organization. It has of course been a long and arduous journey for us to get to this point but without a doubt, every endeavor has been worth its weight in gold since now our privileged customers can be that much more certain about the standardized quality of all our offerings, along with complete respect for the environment in which we operate. This certification has come to us from no less a body than SGS, the world leader in inspection, verification, testing and certification services. Obviously, their exacting standards have meant that when it came to actually obtaining the requisite certifications we were so earnestly seeking, we had to prove our merit very meticulously. The fact that eventually all our efforts paid off so well whereby we did receive the coveted certifications that we sought speak volumes about the quality and standardized processes that we follow here at PT. Bio Takara. Of special note would be the fact that stringent quality measures have been the forte of PT. Bio Takara right from the beginning. Be it false eyelashes, wigs, hair extensions or toupees, we have always followed the same onerous regimen in producing them, keeping in mind the entire eco-system around us – be it customers, our employees, the environment and just about any and every stakeholder connected to us in anyway. Furthermore, it is because of this rigorous impetus that we have maintained on quality standards that businesses and wholesalers from around the world have been able to gain access to our exclusive private label of offerings whereby we serve as an OEM or Original Equipment Manufacturer for beauty businesses all over the globe. Indeed, dealing with us, they can be assured of our superlative custom design services as well as our entire lineup of products which remains very premium in quality and service and yet quite affordable. Against this backdrop, it would be appropriate to get an understanding of these ISO 9001:2015 standards which will in turn allow you to appreciate the fact that we are the proud recipients of these certifications, that much better. ISO 9001:2015 is a subset of the entire ISO 9000 family which addresses various aspects of quality management and contains some of ISO’s most well-known standards. These standards provide direction and tools for companies and organizations that want to ensure their products and services consistently meet customer requirements, and that quality is constantly improved. Within the ISO 9000 family there are many subsets such as ISO 9001:2015, ISO 9000:2005, ISO 9004:2009, and ISO 19011:2011. ISO 9001:2015 in particular endeavors to set out the criteria for a quality management system and is in fact the only standard in the ISO 9000 family that can actually be certified, although certification per se is not mandatory. Businesses around the world, big or small, and regardless of their area of operations, aspire for ISO 9001:2015 certifications. In fact if we look at current statistics we find that ISO 9001:2015 has already been implemented by over one million companies and organizations across the globe in over 170 different countries. 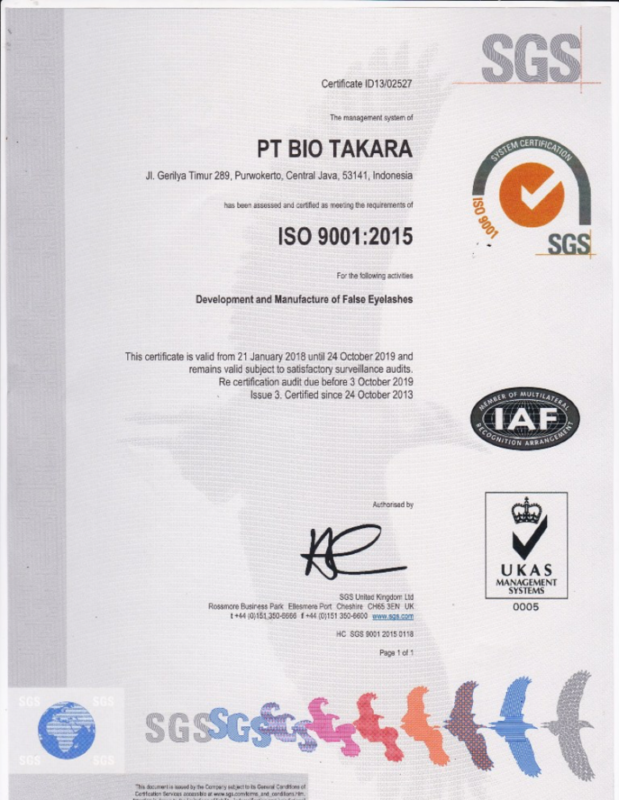 This clearly speaks volumes about the importance that businesses all around the world are attaching to ISO 9001:2015 certification in particular, and the case has been no different with us here at PT. Bio Takara. We were of course confident of our quality processes and overall quality standards, from the very beginning. Yet we wanted that the whole world should recognize us as such, especially when it comes to both our existing as well as potential stakeholders, so that the confidence in dealing with us is that much higher. Today, with our ISO 9001:2015 certified stature in place, the faith that we had in our quality processes has been duly ratified. PT. Bio Takara has no doubt striven to be the best in its business as far its chosen realm of false eyelashes, wigs, hair extensions or toupees. No doubt, volume based manufacturing has been our forte given the fact that we have to cater to large clients, with bulk orders. At the same time, our ability to cater to these large clients with their voluminous orders has not come at the cost of quality compromise. Instead, the status quo has been just the opposite wherein our focus on quality has strengthened even more with increase in orders. It is for these reasons that SGS had no qualms in certifying us with the ISO 9001:2015 quality benchmark certificate. Today marks the day when we confirm the award of these coveted certificates to PT. Bio Takara. We are undoubtedly delighted with this development, so please feel free to join us in our celebrations, in person or in spirit, as we strive towards greater standards of excellence in every area of operations. -7 43' 81.86", +109 24' 92.37"
Communication is the key of success of any project. Tell us what you need and we will come up with the perfect solution. Copyright 2014 - PT. Bio Takara. All rights reserved.